Who are the Top Ten Travel Blogs For Entrepreneurs? 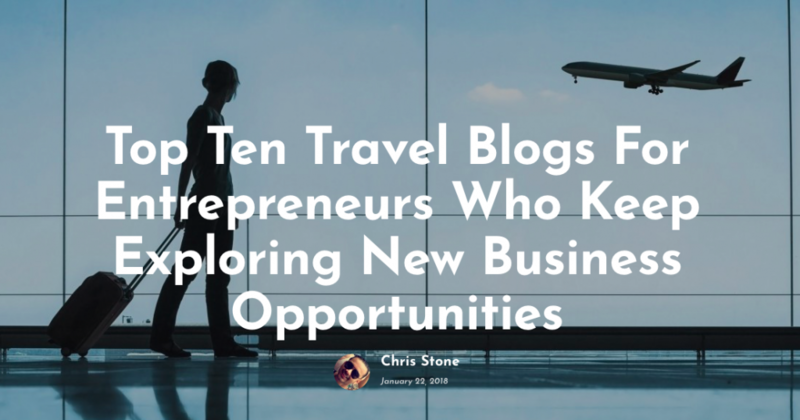 Thank you for including me in the Top Ten Travel Blogs For Entrepreneurs Who Keep Exploring New Business Opportunities! Travel and entrepreneurship go hand in hand, and there are countless stories where entrepreneurs go on pleasure sojourns, when all of a sudden something clicks in their mind,an inspiration forming a basis for an innovative idea to work upon. For instance,Howard Schultz, the former CEO of Starbucks,gleaned inspiration by the coffee shop experience he witnessed in his visit to Italy in 1983,where he perceived the popularity of Espresso bars in Milan, back when he was a director of retail operations and marketing.After coming back from Italy, Howard Schultz some how managed to convince the founders of Starbucks to shift their business model from supplying coffee to fine restaurants and espresso bars to creating a whole exceptional coffeehouse culture for the customers in downtown Seattle.His efforts bore fruit, and now Starbucks is the largest coffeehouse company in the world, touting 22000 stores globally, over a period of 25 years. History is abounding with business success stories, which are comprised of the experiences of the people and what they witnessed on their various excursions. People around the world have diverse styles of living, and those who keep on exploring the world through travel, bring not only the wonders of those cultures back home, but also the memories and experiences they had had on the trip.The main challenge associated with travelling is that it requires time and money, and most of the entrepreneurs are pretty busy in their lives, not being able to spare time to leave their business operations for travelling. Internet has somehow made it easier for people to experience many things while perusing at the comforts of their home. Here we have selected a few people who cannot get enough of travelling, and have come up with stellar blogs for helping travelers and entrepreneurs in experiencing cultures across the universe by just taking out a little bit of time from their busy schedules. Keith Jenkins was a name to contend with in the banking industry for about a decade before he left it to follow his passion for travelling, since he often felt a void in his life, despite being so ahead in his career. Now he travels around the world and manages his blog, titled the Velvet Escape”. Here is the sample screenshot from his visit to Camps Bay, Cape Town, South Africa. Mia Voss is an entrepreneur, a brand ambassador, and the ultimate definition of a traveler. Since she returned from a 3 week sponsored trip to Italy, she dove into a full term travelling career, as she loves connecting with new people. Mia has traveled the world from Italy to Austin, from the exotic islands to Americana. She manages her blog with the name “That’s what she said” and shares her trips with her audience who cannot resist virtually visiting these new places with her. Here is the recent click from her latest trip to Jamaica. Sabina Trojanova’s passion for travelling ignited with her moving around to different places where her father’s job got transferred. Now she is obsessed with travelling around the world, experiencing new fashion and veggie food as she describes on her Twitter account. She also has an amazing blog, “GirlvsGlobe”. Here is an image of Nova Scotia where she recently paid a visit. Lawrence and Jessica Norah is the couple that dreams are made of,traveling around the world and blogging about their awe-inspiring journey experiences. People who love travelling can glean amazing tips, stories, and advice for what to do and how to prepare for travelling to these places. Grab all their recent travel stories on their blog, known as the ”Independent travel cats”. Recent click from their trip to Isle of Wight. Stefanie Fauquet is a lifestyle blogger and family traveler. She resides in the Tampa Bay area with her husband who is also a blogger and her 13 year old daughter. She has launched her blog “Mommy Musings” to share her amazing expedition experiences with travel aficionados all over the world. Here,you can join her on all her amazing excursions. Here is a click from her recent trip to The Roman Forum. Iain Mallory became aware of his passion for seeking thrill, adventure and travel when he served in an Army Physical Trainings Corp, where his primary duties involved running the unit’s fitness program and providing instructions for adventurous outdoor pursuits to different corners of the world. He did some mountaineering, skiing and many other adventurous activities, which helped him gain the prerequisite skills to satisfy his passion for adventure. He started travelling across the world to different exciting places where he could indulge in his passions. So if you are fan of visiting mountainous and thrilling places, his blog “Mallory on Travel” is a perfect fit for you. Here is one click from his trip to Mount Athos. Johnny Ward had always sported an urge for travelling, and if you are determined and keenly want something in life, there is nothing that can stop you from achieving your purpose. Johnny Ward hailed from a poor family and spent the first 13 years of his life on welfare payments. He struggled a lot and moved to England after he turned 18, where he pursued higher studies. He later decided to gratify his passion for travelling and exploring the world. He roams around the world like a free spirit, and takes shots of places he visits and upload them on his blog “One Step 4Ward”, so that his audience can revel in the wonders of the world as well. Recent click of his visit to Scotia Yemen. Becki is an award winning writer working at the British Travel Press, in addition to being an avid explorer as well. In her childhood, she used to look at maps wishfully, but did not have enough finances to embark on grand adventures. However, in her teenage years, she went to Russia and Europe on a school trip for learning more about the Cold War history and at the age of 24, she quit wasting her money on short package trips and went on her first independent trip to Vietnam. Currently she roams around the whole world exploring new places, in addition to managing her blog “Borders of Adventures” as well where top class clicks from her recent trips can be found in her blog posts. Recent click from her visit to Roman City of Spain. Brian Chesky is the Co-founder and CEO of Airbnb, the world’s top accommodation provider touting a presence in 65000 cities and 191 countries. Brian Chesky is lucky enough to glean great opportunities for roaming around the world and meeting different people. He loves blogging, so he shares all of his stories on his profile “Brian Chesky”. Lisa Niver is a travel expert, artist and entrepreneur. She has explored 99 countries to date, and is continuously engaging in exploring adventures around the world. Her blog “We Said go Travel” is read by more than 300,000 people each year. She also adds videos about her travel trips which cross over 1.3 million views on three channels Roku, Youtube and Amazon Fire Tv. You have perused through the list of top travel blogs for entrepreneurs who wish to travel to new places for exploring business opportunities and ideas. You can also easily get connected with these influencers on their twitter for interacting with them indulging in their latest trip at home. Thank you to Chris Stone and Branex for including me and We Said Go Travel on your new list! I am honored to be included. I congratulate you on the success you are in such a prestigious list, because I strongly believe that travelling is the best investment people can make.